© 2000, 1978 Margaret L. Benner All rights reserved. Although you are probably already familiar with basic subject-verb agreement, this chapter begins with a quick review of basic agreement rules. 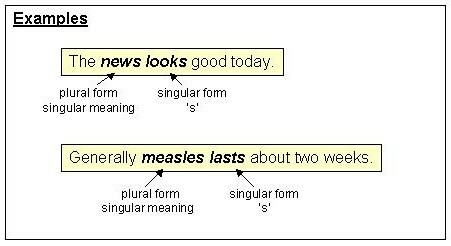 Subjects and verbs must AGREE with one another in number (singular or plural). 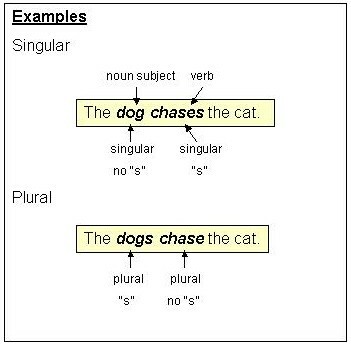 Thus, if a subject is singular, its verb must also be singular; if a subject is plural, its verb must also be plural. 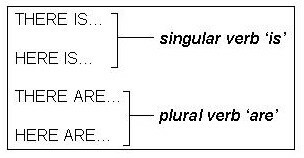 In the present tense, nouns and verbs form plurals in opposite ways: nouns ADD an s to the singular form; verbs REMOVE the s from the singular form. The agreement rules do, however, apply to the following helping verbs when they are used with a main verb: is-are, was-were, has-have, does-do. The subject-verb agreement rules apply to all personal pronouns except I and you, which, although SINGULAR, require PLURAL forms of verbs. Now click on the link below to do exercise 1. Compound nouns can function as a “compound subject.” In some instances, a compound subject poses special problems for the subject-verb agreement rule (+s, -s). 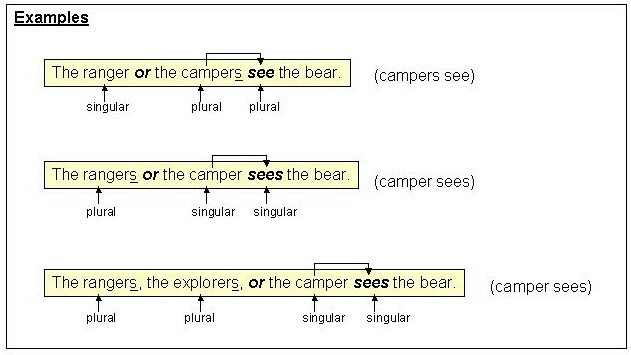 Although each part of the compound subject is singular (ranger and camper), taken together (joined by and), each one becomes a part of a plural structure and, therefore, must take a plural verb (see) to agree in the sentence. However, or and nor can pose a more difficult problem. What if one part of the compound subject is singular and the other part is plural? What form of a verb should be used in this case? Should the verb be singular to agree with one word? Or should the verb be plural to agree with the other? 1. 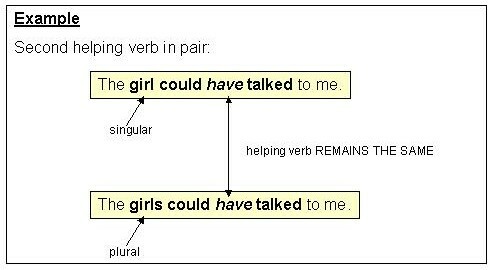 If the individual parts of the compound subject are joined by and, always use a plural verb. Now click on the link below to do exercise 2. Some nouns which name groups can be either singular or plural depending upon their meaning in individual sentences. Because they can describe either the individuals in the group (more than one – plural), or the group as a single entity (one only – singular), these nouns pose special problems. However, there are some guidelines for deciding which verb form (singular or plural) to use with one of these nouns as the subject in a sentence. If we refer to the group as a whole and, therefore, as a single unit, we consider the noun singular. In this case, we use a singular verb. If, on the other hand, we are actually referring to the individuals within the group, then we consider the noun plural. In this case, we use a plural verb. Of course group nouns, like other nouns, can also appear in plural forms (with an s). When used in the plural form, group nouns mean MORE THAN ONE GROUP. Thus, it uses a plural verb. 1. Group nouns can be considered as a single unit, and, thus, take a singular verb. 2. Group nouns can be considered as individual members within a single unit and, thus, take a plural verb. 3. Group nouns can be given plural forms to mean two or more units and, thus, take a plural verb. Now click on the link below to do exercise 3. Some nouns are regularly plural in form, but singular in meaning. Even though these nouns APPEAR to be plural because they end in s, they actually refer to only one thing made up of smaller, uncounted parts. Therefore, they are considered singular. You can see that substituting that pronoun it instead of they makes more sense here. Another group of plural form nouns end in –ics. Similarly, it is a more suitable substitute for any of these words than is they. These nouns appear to be plural (end in s), but generally refer to only one thing and are, therefore, generally considered singular. NOTE: Occasionally, however, the –ics nouns can have a plural meaning: We can speak about individual parts of these wholes. In this case, we apply the same rule as applies to group nouns when we consider the individual members within the group (see Section 3.3): We use a plural verb. 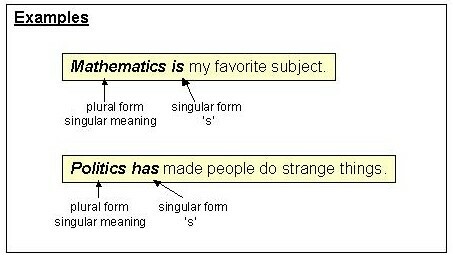 Note the difference in meaning and, therefore, in the verb chosen (singular or plural) between the two uses of the –ics noun, statistics. Now click on the link below to do exercise 4. Indefinite pronouns can pose special problems in subject – verb agreement. The difficulty is that some indefinite pronouns sound plural when they are really singular. As subjects, the following indefinite pronouns ALWAYS take singular verbs. Look at them closely. These should be easy to remember. 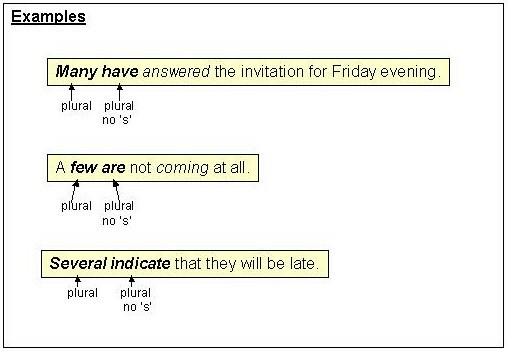 However, the following indefinite pronouns ALWAYS take plural verbs. 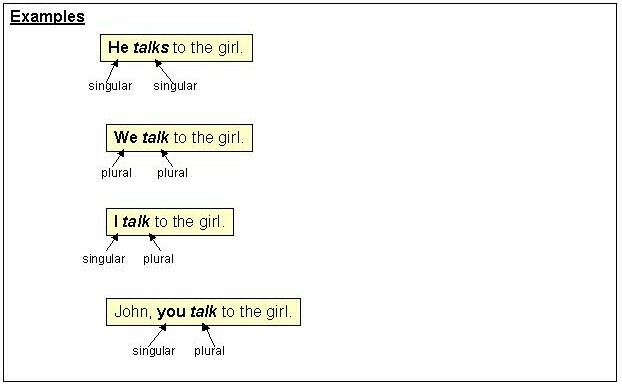 A third group of indefinite pronouns takes either a singular or plural verb depending on the pronoun’s meaning in the sentence. Look at them closely. Now click on the link below to do exercise 5. So far we have considered subjects that can cause subject-verb agreement confusion: compound subjects, group noun subjects, plural form – singular meaning subjects, and indefinite subjects. The remainder of this teaching unit examines subject – verb agreement problems that can result from word placement in sentences. There are four main problems: prepositional phrases, clauses beginning with who, that, or which, sentences beginning with here or there, and questions. 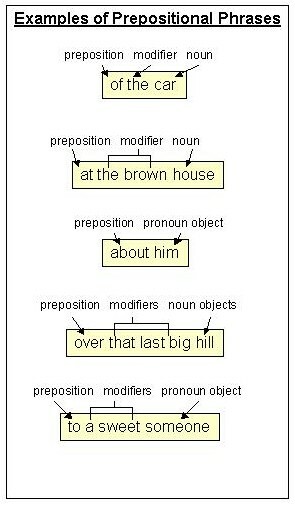 A prepositional phrase may be placed between the subject and verb. 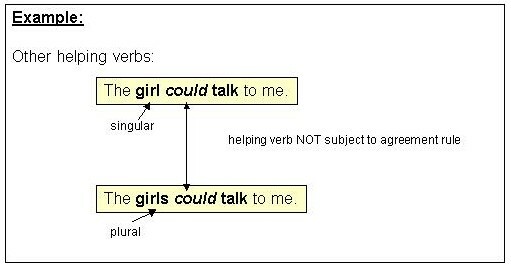 In the above example, the singular verb is agrees with the singular subject boy. Sometimes, however, a prepositional phrase inserted between the subject and verb makes agreement more difficult. Car is the singular subject. Was is the singular helping verb which agrees with car. If we aren’t careful, however, we may mistakenly label riders as the subject since it is nearer to the verb than car is. If we choose the plural noun, riders, we will incorrectly select the plural verb were. 1. Learn the major prepositions (see page 28). 2. Be alert for prepositional phrases placed between the subject and verb, and identify the noun in the phrase immediately as the object of a preposition: An object of a preposition can NEVER be a sentence subject. 3. Locate the true sentence subject and choose a verb which agrees with it. 4. Remember the indefinite pronoun EXCEPTIONS considered in Section 3.5, p.18: Some, Any, None, All, and Most. The number of these subject words IS affected by a prepositional phrase between the subject and verb. Now click on the link below to do exercise 6. 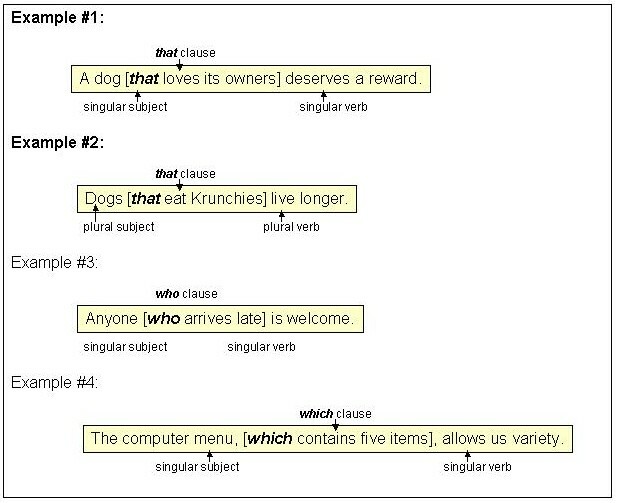 A clause beginning with who, that, or which and coming BETWEEN the subject and verb can cause agreement problems. Like the prepositional phrase, the who / that / which clause never contains the subject. TO AVOID SUBJECT – VERB AGREEMENT ERRORS . . .
1. Identify who / that / which clauses immediately. 2. Locate the true sentence subject and choose a verb that agrees with it. Now click on the link below to do exercise 7. When a sentence begins with there is – there are / here is – here are, the subject and verb are inverted. After all that you have learned already, you will undoubtedly find this topic a relatively easy one! The verb in such constructions is obviously is or are. The subject, however, does not come BEFORE the verb. Instead, the subject in this kind of sentence comes AFTER the verb, so you must look for it AFTER the verb. 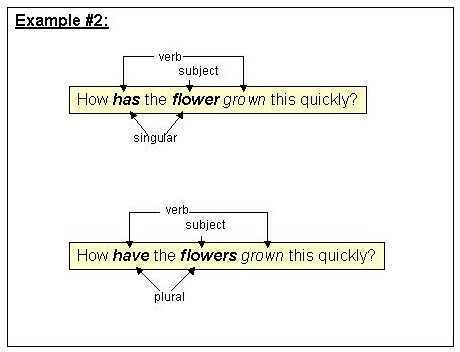 In this example, because the subject, book, is singular, the verb must also be singular. 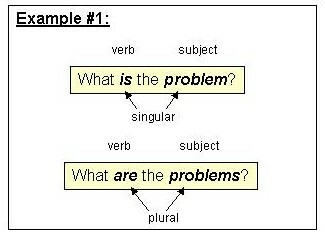 If the subject is plural, however, then the verb must be plural. 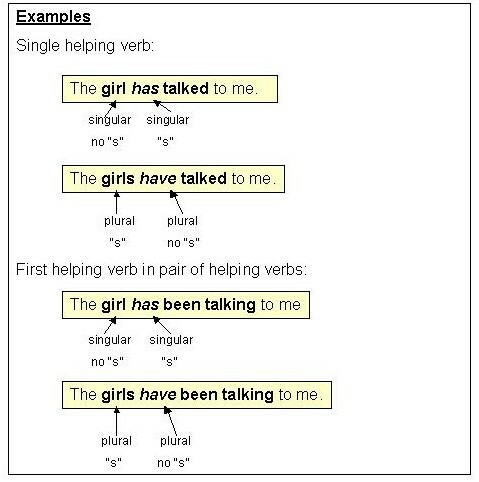 In this example, because the subject, books, is plural, the verb is also plural. 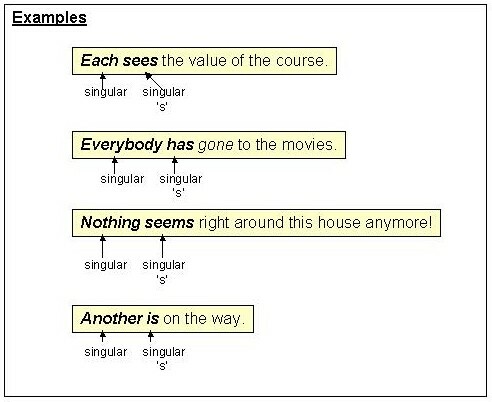 Remember: In here is – here are / there is – there are constructions, look for the subject AFTER the verb and choose a singular (is) or a plural (are) verb to agree with the subject. And finally, sometimes creating a question will cause the subject to follow the verb as well. Here, identify the subject and then choose the verb that agrees with it (singular or plural). Now click on the link below to do exercise 8. Click on the link below to do the Post Test.